Boat Brokers software for NSW Police compliance. 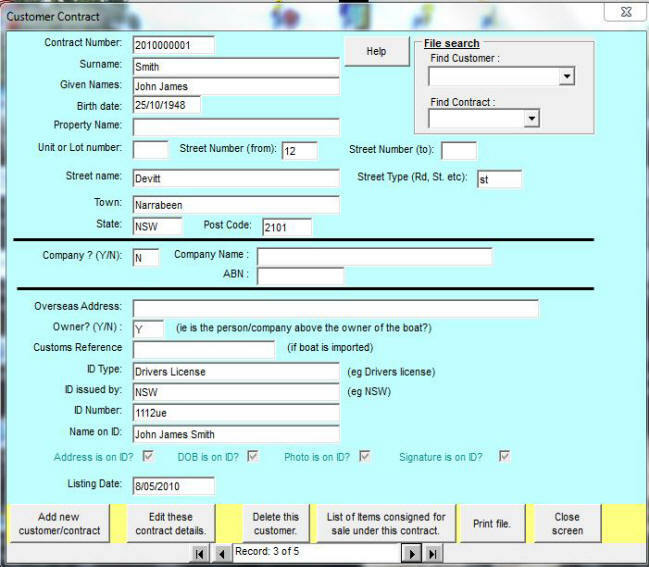 The Boat Broker for NSW Police software package has been developed by a Broker member of the BIA of NSW to assist brokers in complying with current Dept. of Fair Trading laws. It runs under Windows XP, Windows Vista, and Windows 7,8, and 10. This system has been designed for Boat Brokers, and not businesses in the jewellery trade or any other type of second hand dealership. The system enables you to enter details of clients for whom you are selling a boat, whether they are a private individual or a Company. You can then record the information about the boat required to comply with current legislation. The software will check the data entered, and then create data files in a format acceptable to the computer system used by the NSW Police. The system can then connect you to the NSW Police web site, where you can go through a simple procedure to upload the files to their web site for checking and compliance. Click here to Download the Trial Version NOW! Trial versions are available free of charge (Download, or contact Possum Gully Software) with the manual being supplied as .PDF file. "Help" files are also built into the system. Trial versions are the same as the "live" version, but do not perform the final step of generating the files for the NSW Police computer. Assistance with using the package is only a telephone call away. IMPORTANT: Read the installation instructions before installing!. Suitable for Windows XP SP3, Windows VISTA, or Windows 7, 8 and 10. (Do not download if you have an older version of Windows). Click on "Brokers Package" below and, depending on the Browser you are using, choose Save when prompted. Select a folder on your computer where you will easily be able to locate the file later on. NOTE: When installing on Windows 7 , 8, or 10 ensure you have Microsoft .NET 3.5 installed. (You probably will). To do this, click on Control Panel -> Programs and Features -> Turn Windows features on or off . Then make sure ".NET Framework 3.5 (includes .NET 2.0 and 3.0)" is checked. When the download is complete, use Windows Explorer to locate the file you have downloaded (eg Broker_DFT_Package_WIN10.exe). This will be in your "Downloads" folder, or in the folder you selected above. Double click on this file and the installation will commence.